With any project, it’s always tempting to go straight in, tools blazing, to create your dream space – whatever the cost. For those of us who can’t muster the courage (or the budget) to do that, a new bathroom or kitchen can be a less exciting, more gradual process. After extending their new home, Kath and Vivian had very little budget to finish the kitchen, so they lived with what they had for years while saving for a better design. The result is a small yet perfectly formed space that holds its own against the bold character of the rest of the house. Find out how they did it, then find inspiration for your makeover with our ultimate guide to planning, designing and costing a kitchen. See all our real home transformations, too. ‘When we bought the house, we knew we wanted open-plan living,’ Kath says. ‘We knocked through the sitting and dining room and extended into the side-return space before we moved in. 'Unforeseen circumstances meant we couldn’t afford to do the kitchen at the same time, so we lived with it for five years until we had enough money for the dream kitchen we wanted. ‘I had a list of things our kitchen had to be. I wanted it to be part of the downstairs living space and not just a room shut off from everywhere else – somewhere we could sit and have drinks with friends. ‘We ended up going to a local company for the new kitchen. We thought they’d be more expensive but they weren’t, and they were really flexible, too. They didn’t bat an eyelid when I said I wanted copper around the island and a foxed (distressed) mirror splashback. 'I drew up the cupboards on a piece of graph paper and wrote down all the junk we had in the kitchen. It all had to have a place to go, and I wanted worktops to be relatively clear. ‘The side-return extension was small but it made a huge difference to the available space in the kitchen and dining area. Phase two was about using that space better by making it more open plan, but we were limited by the kitchen’s size and placement of doors. ‘We removed the wall separating the kitchen from the seating area. We wanted to knock down another wall, too, but it would have been too expensive with the steelwork involved. It’s worked out well, though – I’ve got more wall to hang pictures on. ‘To draw the eye out towards the garden, we replaced the L-shaped kitchen with a galley style. The work took about six weeks. At the time it was awful; we had a microwave on the dining table, and the dust got everywhere. 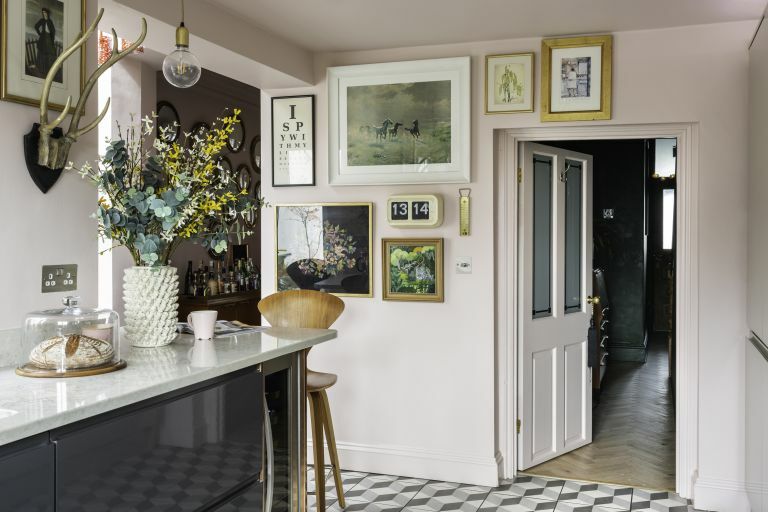 'It’s what makes the kitchen stand out – I mean, who paints their kitchen pink? We also have a copper sheet wrapped round the bar area and lights under the worktop. It’s the little touches that have the biggest impact. ‘Although our 25-year-old daughter Natasha does come home occasionally, it’s normally the pair of us living here – the kitchen really is a space for two. But when the girls come round for drinks, we can tuck the stools under the bar to create more room. ‘The bar area is integral to the open-plan space. You can see everyone in the dining and sitting room as well as the kitchen. Everyone congregates here at Christmas and at birthday parties – I can put drinks out on the worktop and it becomes a natural gathering point.